When we talk about animal free make up, usually we think of the cosmetic products that have been tested on animals, or sometimes contain animal derived ingredients. But there is another aspect to 'putting on your face' that also requires thought if you are hoping to avoid animal products; make up brushes. A lot of make up brushes on the market have bristles that are made from animal hair, and in fact a surprisingly wide range of animals are used to supply the hair. Whilst much of the hair for make up brushes is a by-product of the food industry, brushes might also be made with squirrel, sable, goat or pony hair. Different furs give different effects for different brushes depending on the stiffness and other properties of the hair. It is not consistent however, for cosmetics companies to offer cruelty free make up, but to use animal based brushes, so more and more often synthetic alternatives are being used to create high quality make up brushes. Toray and Taklon are modern, man made alternatives to hair, which can be used to fashion make up brushes. Although some manufacturers will claim the hair in their brushes comes from a natural moulting process and animals are not harmed or killed to gather the fur, true vegans or those wishing to live an animal free lifestyle will prefer a synthetic brush. Toray and Taklon are very fine nylon hairs which many make up artists swear by for giving clean lines when applying make up. Softer, finer versions work well for blending. Although some people claim animal hair brushes work well with dry powders, as opposed to synthetic brushes working best with wet make up, improved manufacturing techniques mean it is no longer so easy to find a distinction. Several cosmetics companies have opted for all synthetic brushes which have excellent results. The Body Shop sell kits of entirely man made brushes that they claim make up artists rave about, so buying synthetic does not have to mean compromising on quality. Because of the uniform nature of synthetic hairs, often brushes made from this are perfect for very fine detail work like lip lining, or close to the eye highlighting or shading. But it is possible to get great blusher style brushes in man made materials as well. 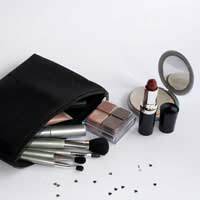 It is a general rule that, as with all tools, you need to spend a little more to get the best quality, and people looking to buy a whole new kit of guaranteed synthetic brushes need to shop around and not just look at price. Going for very cheap brushes could prove to be a false economy as often the bristles are quite hard and can cause soreness around the eye. One trick to extending the life of your make up brushes is to clean them regularly. After applying your make up, you may like to dust any excess powder or cream onto a baby wipe. Don't forget to look for a 'green' one with cruelty free ingredients. Then, once a month you should wash your make up brushes. A good tip is to use very gentle detergent, perhaps an eco friendly wool wash or similar, diluted. Alternatively, try a cruelty free baby shampoo, again diluted. Gently wash the brushes, rinse them thoroughly, then blot them dry with kitchen towel or a gently cloth. Make sure the brushes are formed back into a uniform shape, then leave them to dry somewhere warm, but away from direct heat. Careful attention to your brushes will keep them in excellent condition for years to come, and will ensure your investment serves you well. Hello, I have been vegetarian for 30 years but eating a (mostly) vegan diet. I have been trying to eliminate all man-made materials & products from my life and home, but finding it extremely difficult to source 'vegan' products that are not made from plastic or a petroleum-derivative. I think this is particularly important due to the pollution that plastic products are causing in our environment and particularly in our seas with microfibres being consumed by marine life. It is not something we can continue to allow as our beautiful planet cannot sustain this amount of pollution by plastics. Does anyone know of such natural, animal-free products? Especially hairbrushes, make-up brushes etc. Thank you for your time.